The abandoned husk of a 1960s school building sounds a very long way from a comfortable, ultra low energy family home. 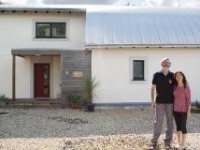 Thanks to a remarkable upgrade effort – influenced by reading Passive House Plus – one Fermanagh family are reaping the rewards of one such transformation. Gerry McPhillips made it clear from the outset that his new home wasn’t merely going to meet Enerphit, the Passive House Institute’s standard for retrofitted buildings. It was going to be certified that it met the standard. This was a particularly ambitious aim for several reasons. For one thing, the building into which he planned to move his family once the job was complete wasn’t even a house. It was a disused school. Achieving passive standards on a new build is tricky enough. Retrofitting passive into an old one is even trickier. 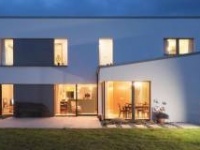 When you also factor in the lack of any passive building experience on his design and build team, the fact that this is Northern Ireland’s first Enerphit project is even more creditable. He points out that if you make it clear that the house will be certified, the targets solidify. An airtightness result of below 1 ACH at 50 Pascals is not a nice-to-have. It must be that airtight in order to achieve certification. McPhillips had originally planned to build a house on his father’s land at Magheraveely in Co. Fermanagh. Planning restrictions however required that any new structure be ‘visually linked’ to the existing farm buildings, which essentially meant placing the house at the centre of a working farm. This wasn’t going to work for the family, so they began looking further afield. It was McPhillips’ father who suggested looking more closely at his old primary school when it came up for sale in 2014. It had been closed down two years earlier as part of a rationalisation process that closed several other small schools in the area. This was a typical 60s schoolhouse. An elongated, single-storey with huge south facing windows and extensive grounds. The one big advantage of the building was its location. It stood right at the end of the lane that led up to his parents’ farm. There was a certain amount of flexibility however. The school itself was beginning to slip into disrepair and the grounds had become overgrown. Aware of the need to create a family home from an old school, the Planning Service allowed McPhillips to strip the building right down, remove the roof and raise the walls. The drive for passive emerged early in the project. As McPhillips worked through his research, searching for a way to keep running costs down, he found that he was consistently being drawn back towards low energy in general, and passive in particular. At the time however, most of the passive projects either completed or underway were south of the border. There was a general lack of expertise in Northern Ireland. Things were however changing in that regard. McPhillips had discussed other possible sites and projects with Enniskillen-based architect Chris Allen before he settled on the school in Magheraveely. When he returned to Allen to discuss his plans, Allen told him that he had already signed up with the Passive House Academy’s certified passive house consultant & designer course in Wicklow. The architect explains that this job was very different to any he’d worked on before. Together, Allen and McPhillips decided to remove the roof in order to create more height in the building. In addition to giving sufficient room to incorporate a second storey, constructing a new roof made achieving airtightness considerably easier by allowing the build team to incorporate airtightness measures into the new design. Probably the greatest single challenge however lay in tackling the thermal bridges. To help here, McPhillips sought advice from the Centre for Renewable Energy and Sustainable Technologies (CREST), which is attached to South West College in Enniskillen. The centre – housed itself in a passive house pavilion designed by Paul McAlister Architects Ltd, which was the subject of a case study in issue 11 of Passive House Plus – supports innovative renewable energy and sustainable technology initiatives in Northern Ireland, and is partially funded by the European Union. Barry McCarron of CREST explains that the centre supported the project by providing advice on the two critical passive areas of airtightness and thermal bridging. “We carried out some analysis on thermal bridging and made some suggestions which were incorporated into the building,” he explains. Quinn Lite aerated blocks were set into the inner leaf at critical points, while ply boxes were specified for window reveals. As frequently happens with passive retrofits however, some puzzles just could not be solved. In order to boost the team’s airtightness expertise, McPhillips and his project manager, Clive Morrow completed a one-day airtightness course with Ecological Building Systems in Athboy, Co. Meath. Gerry’s brother, Stephen – a carpenter by trade – completed most of the airtightness work. In addition, both their father and Gerry’s father in law – both retired builders – pitched in on site with help and advice. 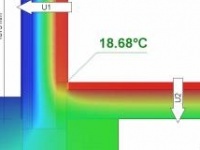 The final airtightness test recorded a result of 0.77 ACH at 50 Pascals – well within the Enerphit threshold. The existing narrow cavity wall had been pumped by the educational authority not long before the school had been closed, but even at that, it didn’t get close to the standard required by Enerphit. 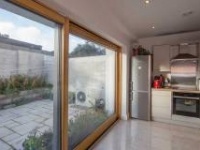 The design team decided to supplement existing insulation measures with external wall insulation. In addition to solving thermal issues, Chris Allen says that it also solved aesthetic ones. The floor was insulated with 200mm of Ballytherm PIR insulation beneath a 75mm screed, while 400mm of Isover Metac insulation was installed in the roof on the flat. Prior to the move, the family had been staying in a series of rented houses, which tended to be old and damp. They moved into their new home in August, and so far, so good – including some unforeseen benefits. Airtightness testing: Air Seal Ltd.
Heat recovery ventilation: Duplexvent, via BPC Ventilation Ltd.
Heat pump: Thermia, via Warmth Ltd.
Before: Not available (no energy calculations done on original building). Before: Standard concrete floor build up. U-value: 0.61 W/m2K. Before: Concrete block walls with 65mm fully filled cavity with blown bead insulation. U-value: 0.38 W/m2K. Before: 200mm fibreglass wool insulation on the flat between roof joists. U-value: 0.20 W/m2K. Before: Double-glazed, PVC windows and doors. Overall approximate U-value: 1.7 W/m²k - 1.3 W/m²k. New triple-glazed windows: Rehau Geneo MD plus triple-glazed windows and doors: Overall U-value of 0.76 W/m2K. Before: Oil fired central heating with standard efficiency boiler. After: Thermia Diplomat Optimum Duo 10kW ground source heat pump with COP of 4.24 as per EN 14511. Underfloor heating system to downstairs. Towel radiators in bathrooms. After: Duplexvent DV145SE heat recovery ventilation system — Passive House Institute certified to have heat recovery rate of 79% / EN 308 certified efficiency of 90%+.